The Naked Waiters are an acoustic, ukulele-based group that started in Cedar City, UT, and is now based in Laie, Hawaii. They specialize in fun, melt-your-heart music that’s good for the soul. 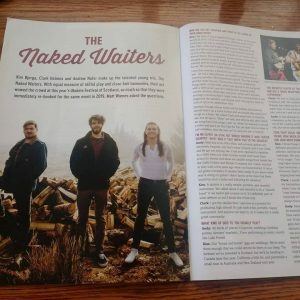 Kim Bjerga, Clark Holmes, and Andrew Nufer make up the talented young trio, The Naked Waiters. With equal measure of skillful playing and close-knit harmonies, their act wowed the crowd at last year’s Ukulele Festival of Scotland, so much so that they were immediately re-booked for the same event in 2019.” WE GOT AN ARTICLE IN THE UK UKULELE MAGAZINE! Scotland liked us enough to write about our performance, and we couldn’t be more honored.” They are becoming increasingly popular on the International Ukulele Festival Circuit, even playing in Australia this year. We loved them so much we asked them right back too. She is also a multi-instrumentalist and music educator based on Vancouver Island, British Columbia. Competent on a variety of instruments Ali also brings her captivating vocals, original writing and arranging to whatever project she is currently focused on. 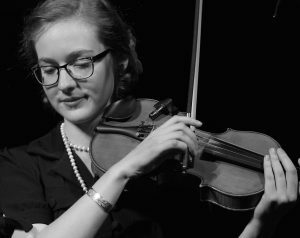 Ali spends her time in Courtenay BC, where she directs two FolkHarmonic Orchestras, FolkHarmonic Voices & teaches private music lessons. Liz’s is one of the organisers of the Nanaimo Ukulele Festival. Her first experience of playing the ukulele was in 2011 on a Princess cruise to Hawaii. A series of serendipitous events helped her continue playing and performing with this wonderful instrument. 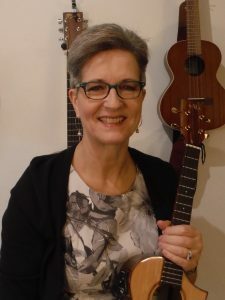 In 2016 she enrolled as a student in the James Hill Ukulele Initiative (JHUI) Teacher Certification Program and will complete Level 3 in June 2019. She has taught a variety of ages (7-82) in private lessons at Arbutus Music School in Nanaimo, BC and now concentrates on Group Lessons and Workshops in her home town of Parksville, BC, at the Ground Zero Acoustic Lounge and the McMillan Arts Centre. She also plays ukulele, bass guitar and sings in a band, the Revolving Doors, who perform at various events in their locale; they also perform at the Nanaimo Ukulele Festival and lead the Sing & Strum. 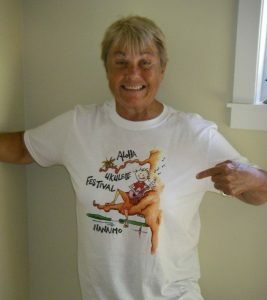 CAROL JOHNS is a Level 1 certified JHUI ukulele instructor who teaches beginner ukulele group lessons in Nanaimo. 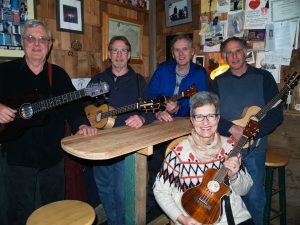 Carol started playing the ukulele with the Nanaimo Harbour City Seniors Nordli group back in 2011. Since then, Carol has taken lessons with Anna Lyman and Flavio Cianflone. She plays with the Folk n Oldies music group and enjoys the performances the group does for various seniors residences in Nanaimo. Carol plans to continue her studies with the James Hill Ukulele Institute teacher training. On Saturday September 14th, after the workshops and Open Mic, the Revolving Doors comprised of Bill Naylor, Ade Barnum, Dean Williams, John Lundine and Liz DeBarros will give a short performance and then lead the “Sing and Strum”. 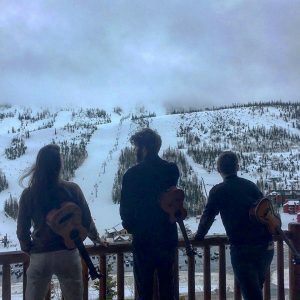 The band is based in Errington and has been playing together since 2014 and regularly perform at the Errington Farmers market in the summer, and at various private parties and dances in their locale. They’ll be leaving the electric guitars and drum kit at home for the Festival.